We’d love your help. Let us know what’s wrong with this preview of Free Play by Stephen Nachmanovitch. This book is about the inner sources of spontaneous creation. It is about where art in the widest sense comes from. It is about why we create and what we learn when we do. It is about the flow of unhindered creative energy: the joy of making art in all its varied forms. To ask other readers questions about Free Play, please sign up. The right book at the right time saves lives. Man, you can say that about Free Play: Improvisation in Life and Art. The thing about play in art, is it's a sign of strength to spare, wind to spare, like someone running a marathon who breaks out into a pirouette. Sometimes working on a long project, the task just seems monstrous--like trying to build a gothic cathedral all by yourself. This book is a reminder, for a writer in long form, that it's not stone on stone, a heavy, exhausting thing. That The right book at the right time saves lives. Man, you can say that about Free Play: Improvisation in Life and Art. The thing about play in art, is it's a sign of strength to spare, wind to spare, like someone running a marathon who breaks out into a pirouette. Sometimes working on a long project, the task just seems monstrous--like trying to build a gothic cathedral all by yourself. This book is a reminder, for a writer in long form, that it's not stone on stone, a heavy, exhausting thing. That play, like the free jazz that the violinist author Nachmanovitch loves, makes heavy work light. That there are other ways to solve problems, other ways to approach the page, and that improvisation, the lightness of it, the in-the-momentness of its playfulness, IS the 'air that falls through the net' that Neruda describes. Here's my favorite part so far-- on editing. "Some elements of artistic editing: 1. deep feeling for the intentions beneath the surface; 2. sensual love of the language; 3. sense of elegance; and 4. ruthlessness. The first three can perhaps be summarized under the category of good taste, which involvers sensation, sense of balance and knowledge of the medium, leavened with an appropriate sense of outrageousness…." I will definitely put Free Play on the shelf right next to The Art Spirit within arm's reach of my writing desk, to remind me about the air that falls through the net. I can't be reminded of it enough. In the fall, I discovered this book in my boyfriend's apartment. "Though love is a material act (whether sexual love, friendship, parenting, or any other kind of devotion, love is always an act), it lifts us out of the ordinary world into a kind of mystic participation with one another. We tune, more and more finely, our capacity to sense the other person's subtleties. We are willing to be infinitely patient and persevering. In a se In the fall, I discovered this book in my boyfriend's apartment. "Though love is a material act (whether sexual love, friendship, parenting, or any other kind of devotion, love is always an act), it lifts us out of the ordinary world into a kind of mystic participation with one another. We tune, more and more finely, our capacity to sense the other person's subtleties. We are willing to be infinitely patient and persevering. In a sense, genius equals compassion, because both involve the infinite capacity for taking pains. The great lovers, the great world reformers and peacemakers, are those who have passed beyond their individual ego demands and are able to hear the cries of the world. The motive is not self-gratification, but gratification of a bigger being of which we are part. Genius and compassion signify a transcendent, painstaking thoroughness and attention to detail--taking the trouble to take care of our body and mind and everyone else's body and mind. This is exactly what we do when we set out on the adventure of loving another human being. We learn, the easy or the hard, to cultivate receptivity and mutual, expressive emancipation." Did not get interesting until the middle, where there were some concrete suggestions on how to play around with limits, the interplay between creativity and judgement. The beginning and the end of the book are weakest, in my opinion. They are filled with too much pseudo-spiritual riffs, or get off track with rants against mainstream society, neither of which did much for me. 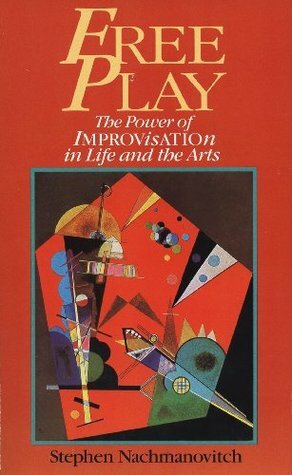 All that said, I still think it was a worthwhile read for what was there regarding improvisation. This is an interesting read on creativity and improvisation to come back to. I read it with pen in hand and highlighted the parts that spoke to me. If I reread, I feel like I might find other parts that capture me next time. Some parts of the book were too filled with spiritual flummery for my taste, and I didn't like that some is written like if it were the objective truth, even though it's the writer's opinion, theories and own experiences. The writing is also unnecessarily complicated, often I This is an interesting read on creativity and improvisation to come back to. I read it with pen in hand and highlighted the parts that spoke to me. If I reread, I feel like I might find other parts that capture me next time. I read this book at least twice. It worked. I was trying to be a serious musician and artist; I'd just discovered that I loved writing. I wish I could remember more, but there was something about the description of the human need to create though improvisation (play) that resonated with me. I might just have to read it again. Man do I love this book. No really. I've read it four times at different points in my life and each time I find something new and awesome. If, for some reason, you want to know my philosophy on creativity and the purpose of art, this is the book to start with. One of my favorite books. I've reread it several times, and referred to it often. An inspiring reminder of what it means to be awake to the moment and to receive its possibilities with gratitude and imagination. Recommends it for: To all artist, and anyone who loves to play! This is one of my favorit books! I go back to it often when I need a reminder about the role of play and creativity in life. This book is filled with stories, and lessons about the bigs and smalls of life. The take home message is: Relax, and bring play and into all aspects of life! If you are an artist of any sort, read this book. During the late 1980s and early 1990s I worked in a bookstore that managed to survive the mega-chain onslaught and political shifts that killed off most of the independent literary stores and others such as the local specialist feminist and the Marxist/leftist book store as well as quite a few of the second hand stores. Across the road from us was another survivor, specialising in New Age and similar publications. Like many independents, we relied on the high turnover of a few titles to allow us During the late 1980s and early 1990s I worked in a bookstore that managed to survive the mega-chain onslaught and political shifts that killed off most of the independent literary stores and others such as the local specialist feminist and the Marxist/leftist book store as well as quite a few of the second hand stores. Across the road from us was another survivor, specialising in New Age and similar publications. Like many independents, we relied on the high turnover of a few titles to allow us to keep a broad set of literary and non-fiction books with a much lower turnover: now we’d call that a long tail. Every few weeks, at our regular staff meetings we’d discuss sections of the store we thought we’d like to know more about, and at most, if not every second of those, someone would observe that the ‘north west corner’ was a bit of a mystery, and we’d all nod, slightly perplexed by direction until we realised, this as the area labelled ‘self-help’ (although nowadays that is more likely to be ‘body, mind, spirit’ or some such (perhaps even popular psychology). In my case, not only was this corner of the store a mystery area, it also seemed like a big pile of hokum – truisms for the desperate bundled up inside usually some crudely articulated version of ‘Eastern’ mysticism as a foil for the weaknesses of the ‘West’ with its ‘alienating rationality’. All this meant that I was more than a little unsettled when, acting on the advice of a musician friend whose work I respect, I picked this up to find the publishers had classified it ‘self-help’: my retail bête noir. The book has many of the characteristics of the ‘self-help’ style, at least those few I have dabbled in – the breezy knowingness, the magpie approach to various ‘Eastern’ religious concepts, the step-by-step progress through the problems of our inner being. To his credit though, Nachmanovitch manages to avoid the ‘here’s the answer to everything’ tone of many in the genre, or the serial re-visioning and restatement of one idea in book after book after…... A key aspect of this ‘avoidance’ is that in his day job he seems to be a practitioner of the cultural/creative work that he is dealing with. And it here that my recommender-friend comes into the mix: Nachmanovitch, the violinist, has been recommended to me by a singer, and voice teacher. So, I read this adopting two standpoints: as a writer (OK, so academic writing but still that relies on a particular creative style), and as on who intermittently ventures into the scholarship of play (basing this on the title, Free Play). Of course, there is a whole bunch of play theories we call on but the one I kept coming back to is a set of ideas that sees almost anything as play if we approach it with the ‘right’ attitude – that is, an attitude of playfulness (a ludic disposition). We’ve all seen that, the ‘game’ that should be fun but is a dull grind – I see it all too often in sports matches – because the ‘players’ did not approach the game with a ludic expectation. A ludic attitude can make pretty much anything fun, but drawing on the work of one play scholar, the cultural historian Johan Huizinga, ludus is one aspect of play while the other paidia seen by French philosopher of play Roger Caillois as having four stages – disturbance, tumult, fantasy and imagination. By my reading, Nachmaovitch’s Free Play works best as paidia (there is an essay about this I have co-authored in a recent edited collection of philosophical papers). Adopting this standpoint gave me a basis on which to make sense of Nachmanovitch’s approach and when I cut through all the dressing of the tao and Buddha and other ‘Eastern’ spiritual trappings this is a pretty good book about a ludic disposition and the limitations placed on its enactment by the constraints of the ‘way things should be done’. (btw: as a non-believer I can see many of the same ‘overcoming alienation’ ideas deployed from these religions in forms of monotheism – Christianity, Islam and Judaism – and they’re not that mystical.) What is more, it is full of pretty sensible advice about ways to deal with diversions, distractions and barriers to creative work – be it music, visual or plastic art, sport, writing, dance or pretty much anything else where we need to allow ourselves to be absorbed. That said, the third section of the four that make up the book (‘Obstacles and Openings’), did in places get a little prescriptive, although without falling into the trap of lists or imperatives. I read this book back in 2002 when I aspired to be a roving, down-and-out, bohemian novelist. I remember staying up late into the night underlining passages that felt like a clear expression of a worldview I had never considered. Nachmanovitch asks us to treat every moment of our lives as an input to a creative project: be it a painting, a short story, a computer program, or a story to be re-told. As I look back over my journals from that time of life, I constantly carried creative inspiration. M I read this book back in 2002 when I aspired to be a roving, down-and-out, bohemian novelist. I remember staying up late into the night underlining passages that felt like a clear expression of a worldview I had never considered. Nachmanovitch asks us to treat every moment of our lives as an input to a creative project: be it a painting, a short story, a computer program, or a story to be re-told. "A poetic embrace for the role that muse plays...beyond art. A refreshing balance to reductionist efforts to simply map our way into uncovering the mystery of creativity. People interested in "the five steps to improving your creativity" will find this book highly unsatisfying. People who are intimately familiar with the angst of bringing the new into the world will recognize the undercurrents of brilliance and frustration that coexist with any true new undertaking or inspirational voyage. Message "A poetic embrace for the role that muse plays...beyond art. A refreshing balance to reductionist efforts to simply map our way into uncovering the mystery of creativity. Message with a broader relevance? Inspiration, creativity and discovery are made richer with complexity of experience and perspectives. The tension comes from trying to reduce the complexity to a pure, simple explanation that is so much greater than the sum of its parts. This book ruminates on the nature of creative genius and proposes that we all have genius in us, if we just transcend rational selfhood, express that unbounded expression, and translate it back out through practiced craft. He doesn't tell us exactly how to "transfer this receptivity, compassion, and free flow of mind to everyone and everything we touch" (p. 169) but it's inspiring to know that free flow is possible for all of us. Philosophy of improvisation--cool. The author is an expert in about 85 million different fields, and it helps him write a truly interdisciplinary book that will have some relevance to just about anyone. I only got half-way through this before returning it to the library. I plan to buy it; it's way too dense to read through quickly. The writing is clear, there are just too many ideas in this little book. This is about creativity and improvisation in general. It is mostly about music and I am a painter, but it still managed to become the most influential book on the manner I establish project goals and strategy in my work. A fine little book that I suspect I will come back to time and time again. Creation is hard work and Nachmanovitch will not do your heavy lifting for you, but he will point you to the moon (even—perhaps especially—if you have seen it before). One of the best books I read on creativity. a must read for anyone who wants to develop their creativity. i read this book in college and have revisited it multiple times. Love the book. The book has taught me to turn discipline and learning into an adventure--- and in fact helped me become a better chef and hostess by preparing and the being playful. This is a powerful book, the kind of book that requires more than a single reading. I'll be back. Free Play is wonderful to re-read, or to just revisit some of my underlinings. It continually speaks to me anew. It is always a source of inspiration. Recommended to Jmaynard9221 by: Daphna <3 <3 !! I need to read this again and again, with a highlighter in my pocket. It will be ragged and torn by the time I am 32. This book is wonderful. Whether you paint, write, or play, you'll find endless insight and motivation well worthy of multiple reads. I refer back to the concepts in this book again and again. Note - i accidentally deleted this review originally....maybe the blank screen is the most authentic review I can give you. And I stand by it as the most appropriate review. but if you need more, here's a review below. Although i’ve been at a relatively exciting period in my artistic pursuit of theater, i've only grazed the surface as a beginner. As i’ve worked on more projects, improv, dramatic skits, voice recordings, movement work...there are the initial rushes of excitement, confus Note - i accidentally deleted this review originally....maybe the blank screen is the most authentic review I can give you. And I stand by it as the most appropriate review. Currently i’m working in a theater piece, just 8 lines...and tonight in rehearsal I tried on a different attitude, or an approach toward this character...the director wanted me to approach an ordinary waiter, with a little more unapproachableness, and visible anger. Only given 8 lines, and as many chances to react, I had to tap into some totally different aspects of myself to get there. And to get there I had to drop all my preconceived ideas of this character..and how they should respond. And I did get there...and next week i will get there, a little further..to a point when we perform, I may not even know what that “there” looks like…. Using the material at hand (“bricolage”) and surrendering to the moment at hand, finding quality, giving voice to the original impulse...all of this sounds far away, mystica. But as Nachmanovich stated, ““Mysticism” does not refer to cloudy belief systems or hocus pocus ;it refers to direct and personal spiritual experience”. Overall I found the read to reflect my own experience. May the unfolding creative, spiritual process continue to reward all you artists -- and by that I mean everyone!